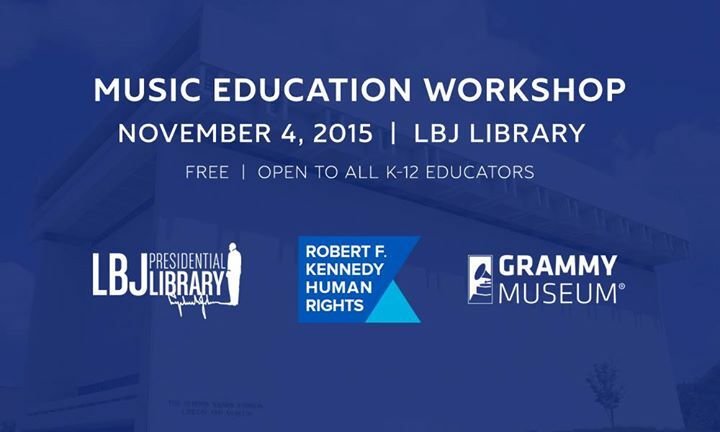 On Wednesday, Nov. 4, 2015, the LBJ Presidential Library will host the GRAMMY Museum and Robert F. Kennedy Human Rights for a presentation of their free professional development workshop designed to provide K-12 educators with curriculum resources as well as strategies and skills to introduce music as a tool to teach core content subject. The workshop will outline the RFK Human Rights’ Speak Truth to Power curriculum and the GRAMMY Museum’s Civil Rights curriculum. The workshop will also feature an interactive songwriting workshop, designed to teach educators the basics of songwriting. The workshop will take place in the LBJ Library classrooms on the second floor. Lunch will be provided. Workshop is free, but registration is required.